Who is Jesus to the Emergent Church? 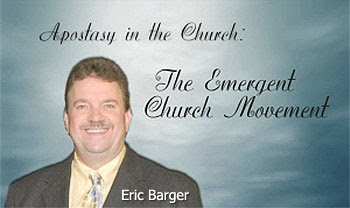 Eric Barger: I think some of the Emergent Church leaders would see Jesus as the Son of God, though there are varying degrees of this. Jesus becomes to them more of just a social justice figure. Jesus' ministry to them would have been about feeding the poor and all and not about saving their souls, which must be part of serving the needy. The other belief Emergent leaders teach which twists Jesus' teachings is about saving the planet and not lost people. I attended a particular conference in Nampa, Idaho. It'd been two days of redefining Christianity. At the end of a session, Brian McLaren told people to come up and take water from a vat that was up there on the table and rebaptise themselves into the new Christianity. I have never heard of anybody baptizing themselves into the real Christianity. He then said that while you were up there to make sure that you put your hands into the tub of dirt. They had a farmer's tub that you would feed livestock in full of dirt. He then instructed us to put our hands in there to feel what needed to be saved, in other words the earth. I was at this conference with another pastor and we had taken copious notes all throughout the conference. That is exactly what we both heard him say. No one went up and put their hands in the dirt, by the way, but the idea was that the earth's salvation is what they advocate. Dr. Reagan: Another aspect of this movement that I am picking up more and more on is that more of these guys are buying into the idea that there are many different roads to God. They're asking, "Who are we to say that Jesus is the only way to God?" Eric Barger: Yes, Emergent churches are adopting one of two brands of Universalism. One brand says that all paths to God and all religions are equal. The other one says that everybody is already saved. That is a form of Christian Universalism. You would find that teaching in the Emergent Movement more than anywhere else. In the last part of this series on the Emergent Church, Eric will help us identify the warning signs that your church is going Emergent. The christian church has been so contaminated by the world that it looks far different from what came out of the disciples messages and deaths. The knowledge of who God truly is comes from the indwelling of the Holy Spirit soooo all these 'christians' aren't christians? And will this mean when the rapture happens not many christians will be missed because the 'christians' will be here to explain it(rapture) away? oh so many questions and great deceptions to come. Lily, I never thought about it like that! You could be onto somthing. They will explain it away, since they are the "Real Christians". How sad, and the world will believe them.